In the Name of the Church: Vocation and Authorization in Lay Ecclesial Ministry presents insights generated in the 2011 Collegeville National Symposium on Lay Ecclesial Ministry, a gathering designed to prioritize the theological foundations for vocation and authorization in lay ecclesial ministry, and make recommendations to advance excellence in this expanding ministry. The essays presented by seven theologians at the Symposium are included, along with thoughtful input drawn from the experiences of lay and ordained ministers who gathered to "amplify the voice and strengthen the national will to promote effective ecclesial leadership practices identified within Co-Workers in the Vineyard of the Lord." William J. Cahoy is dean of Saint John's School of Theology•Seminary, Collegeville, MN. He has a Master of Arts in Religion from Yale Divinity School and a PhD from Yale University. He serves on the boards of the Louisville Institute, the Commission on Accrediting for the Association of Theological Schools, the Collegeville Institute for Ecumenical and Cultural Research, and the Society for Arts in Religious and Theological Studies. The Church and her understanding of lay ecclesial ministry is facing adaptive challenges and the outcome is still murky! In the Name of the Church: Vocation and Authorization of Lay Ecclesial Ministry doesn't provide definitive answers, rather the writers describe possible directions for the vocation of lay ecclesial ministry anchored in theology and scripture. Cahoy's Introduction and Conclusion are terrific bookends to a scholarly and pastoral treatment of a most hopeful and exciting reality emerging in the Church today. This volume harvests some of the best U.S. thinking on the understanding and implementation of ministry. It will be important reading not only for ecclesial ministers, lay and clergy, but for all informed Catholics in leadership, so that this vision may imbue the full life of the church in the 21st century. If you are curious about the phenomenon of lay ecclesial ministry and its impact on the life of the Church-especially here in the United States-this book represents the most up-to-date wisdom of theologians, bishops, national ministry leaders, and lay ecclesial ministers themselves. 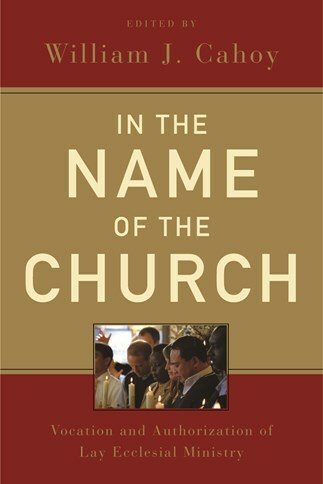 In the Name of the Church: Vocation and Authorization of Lay Ecclesial Ministers represents a landmark set of insights on Lay Ecclesial Ministry on the part of the authors. It also captures and reflects a theological process that represents a consensus of the theology of those gathered for the purpose of pursuing what has come to be a type of new reality in the Catholic community. The voices of the delegates from the sponsoring associations, institutions and organizations responsible for the formation and support of Lay Ecclesial Ministers are reflected in this volume. These authors articulated their own research, engaged in, listened to the dialogue and nuanced key points from and for this visionary community gathered at Saint John University, Collegeville, MN.